The Swedish startup Foap.com is launching soon and they are aiming to create the world’s largest marketplace for smartphone photos. Today, the phones we carry in our pockets act as cameras too, which is most likely the explanation for increased interest in photography. While there are hundreds of photo applications out there, this is the first of its kind. Snap a photo with your mobile and sell it. The Swedish startup Foap.com is launching soon and they are aiming to create the world’s largest marketplace for smartphone photos. There are now 100 Millions Americans who own smartphones (according to a report by research firm comScore MobileLens) and many of them are great photographers. At the same time there is a need for greater variation and more natural photos for commercial use on the market. “With ambassadors from all over the world, we believe that we can create an attractive database of photos and repair the current gap,” says David Los, Foap’s co-founder. Today, the phones we carry in our pockets act as cameras too, which is most likely the explanation for increased interest in photography. While there are hundreds of photo applications out there, this is the first of its kind. 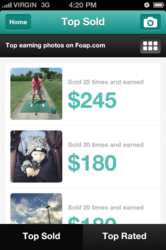 “Foap focuses 100% on building up the market and making sure that we turn the photos into dollars for our users. We do not intend to create another community, instead our aim is to view other photo applications as potential partners,” says Los. The commercial photo market is complex for buyers as well as for sellers, and it can be very frustrating when trying to find photos. Foap.com is co-founded by David Los, co-founder of Tripl.com and Alexandra Bylund, former e-commerce Manager at Solresor.se. They are five total within the team and they are very conscious about the importance of keeping the energy up.